Today a new guy, a red head I haven't seen before, was in my backyard. 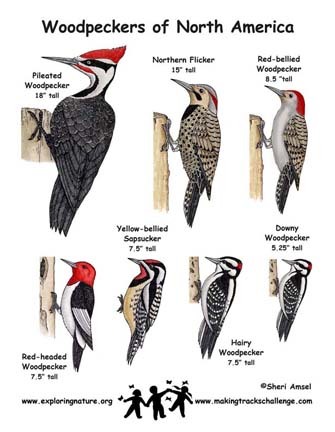 After looking at this chart, pretty sure it was a red-bellied woodpecker. Not sure why it's called red-bellied, because it had a white belly. It's called a red-bellied woodpecker because it has a blush of red on its belly. You probably saw a female, the red blush is not as evident on them as it is on males. What a pretty picture! Yes, the one I saw probably was a female because it did not see any red on its belly. I mostly get blue jays, cardinals, sparrows and grackles here, so it was exciting to see a new bird. Which is why checking more than one or two images is always a good idea. The books that show juvenile, adult, male, female, breeding, and nonbreeding plumages provide a more complete idea of what a species looks like. Gulls are extra-difficult, because there is more than one juvenile stage of plumage. And yes, that’s a might fine photo! Great photos and chart. Nothing more fun to me than bird watching, seeing species you've never seen before, or even heard of...I was thrilled the first time I saw Pileated woodpecker. OP, in Mass., you might be near the flyway birds use to migrate back and forth. That's when you might see strangers at your feeder, stopping by briefly on their way somewhere else. So this spring be watching! And then again in fall. Good idea! I will watch for the migrating birds heading back to their summer homes. 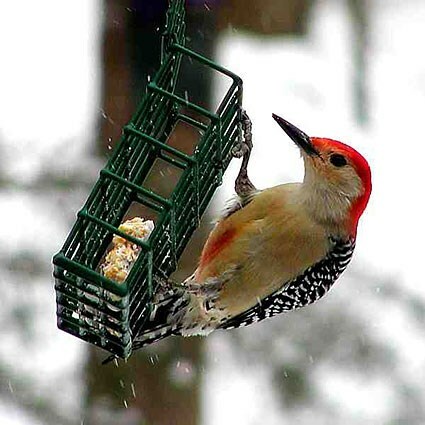 I get lots of red-bellied woodpeckers at my feeders. And yes, they definitely could have come up with a better name for it. It does have a red belly, but it's not very noticeable. I will sometimes see a "stranger" stop by the bird feeder for lunch and then fly away, not to be seen again. One such visitor was a bird that looked like this pic I found on the net. It was here for one meal, then moved in. I forget which bird this is but it sure is pretty. That's a male Rose-breasted Grosbeak.